This is the cause of a Google Adwords Suspended - We know that in the current era of information technology online business to be one potential is quite promising, with a good strategy then a large income will be easy to get, do not need office work, just sitting in front of the computer income you can get. One of the online business strategies is quite popular at this time is to advertise on Google Adwords, advertising media this one a lot of choices, especially for the online business that relies on visitors. With AdWords ads, they do not need to be busy with the affairs of SEO, because with AdWords ads although your site is still fairly new you can still bring in many visitors who can be converted into profit. To advertise on Adword is certainly not easy, in addition to costing the advertiser must also comply with all Google Adwords Policies, if not then it is certain the ads will not be served. Of course, it is not difficult how to the ad in accordance with Google AdWords policy, because Google also already provides a fairly complete reference on the policy, but unfortunately due to lack of caution and less understood to google policy, many of the Adword players who experienced Adword ad his suspend. There are many lists of Google Adwords policies that advertisers need to adhere to, one of the sometimes unacknowledged Adwords policy violations is that sites that are landing pages of Google Adword ads contain non-compliant content. Be careful if you want to advertise on Adwords, pay attention to sites that made the landing page, make sure in it there is no content that violates Google Adwords policy. Proven to lose weight in just 2 days etc. Earn millions of rupiah per day! " This business is so easy, just sit and click! " "You will see an increase of up to 80%!" If there are content as above, then your Adwords ads can be confirmed will be suspended and cannot run because the content is not in accordance with the Adwords policy for user safety issues. Some online business sites do not often include testimonials from their customers, these testimonials are usually presented to convince the visitors of the site to be interested in becoming a customer. But you should be careful when you include testimonials from customers on landing page site google Adwords because otherwise your site can be penalized from Google Adwords, so as not to be a cause of penalty make sure every testimony include a disclaimer. "Disclaimer is a warning sentence to the consumer or the public regarding the quality of real goods, articles, suggestions, advice, forecasts and other abstract items. I write economic analysis, should use a disclaimer, saying that all the losses due to my writing are the responsibility of each, respectively, not the author's responsibility, so the disclaimer is a statement to relinquish responsibility The content is core to the transfer of responsibility from the originator/source to the user. " * Disclaimer: Before using this product you should consult your doctor or specialist first. we are not responsible for any impacts or side effects experienced by customers when using this product due to incompatibility of skin type or customer body. Disclaimer must be included for each testimony, if there are 5 testimonials, then every testimony before the testimony is included must be included discalaimer. 3. You advertise a product that is prohibited by Google. 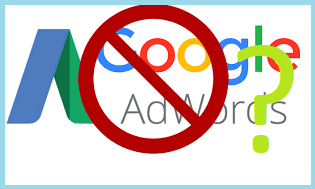 The third culprit that sometimes does not realize the cause of the Adwords advertisement is the advertised product included in the list of products that are prohibited by Google Adwords. Apparently, not all products can be advertised using Google Adwords. Google Adwords has a list or list of products that should not be advertised, if the product you are advertising includes, then no ads will be allowed to run. 4. Does not include a disclaimer for every product benefit. If the site you are advertising happens to be the sale of a product, make sure that in every product benefit you include a disclaimer. Beneficial skin whitening in a short time ("disclaimer: Results can be different for each individual"). When a suspend occurs in your ad, then Google will send a notification email that contains the reason why the ads can be suspended, to improve it should see the contents of the email notification. then make improvements according to the cause. You can submit a review after repairing but remember do not make any submission without any improvement because it can affect the disable of your Adwords account so you will be difficult to advertise again. That's some of the Cause Suspend ad google Adword to watch out for, hopefully, the above information although little can provide additional information to you who happened to be advertising with Google Adwords.